Well, by popular request, the blogging of portrait sessions recommences. If you've been around for a while you may remember seeing a lot more blogs for portrait sessions and model work. When I "re-branded" my website earlier this year I elected to take all those off and focus strictly on couples to help "maintain my brand image". I tried out one of those nifty new Instagram polls however and a whopping 93% of followers said they wanted to see more portrait work. And what better way to kick that off again than by sharing some images from a recent fall shoot I had with Michaela. After shooting earlier this spring, she hit me up to do another session for her. I don't see myself getting tired of couples, but it was nice to shoot some more portrait/model ish type stuff like I used to do so much of. We drove out into the mountains and played around shooting those moody northwest vibes that we all know and love. Thanks Michaela for doing so great in this session and braving the rain. Graduation photos taken at Martin Stadium for Washington State University in Pullman. Hey guys! I hope everyone has been enjoying the fall weather and slow transition to winter. I've really been able to take advantage of the colorful leaves sticking around so long this year and I'm thankful for that. On a recent trip to Eastern Washington, I was able to meet up with Kirsti and take some photos in the Yakima Canyon. This may be a shorter post but it is certainly worth sharing. Kirsti and I were connected through Instagram/a mutual photographer friend. I love the style of modeling she's been doing and knew we could work well together. Thankfully, she felt the same and we were able to make it happen. We ended up getting perfect weather for this session which was great. A cloudy drizzle created great light over the surrounding sage, orange colors of fall, and vast canyon walls. Along with all that, I was happy with how Kirsti styled the outfits. This was probably one of my favorite shots from the set. The sage brush made a great background and Kirsti's flannel colors were a great accent against the grey. If you haven't noticed by now, I have a thing for incorporating roads into a lot of my portraits. Overdone? Maybe, but they still always look good. 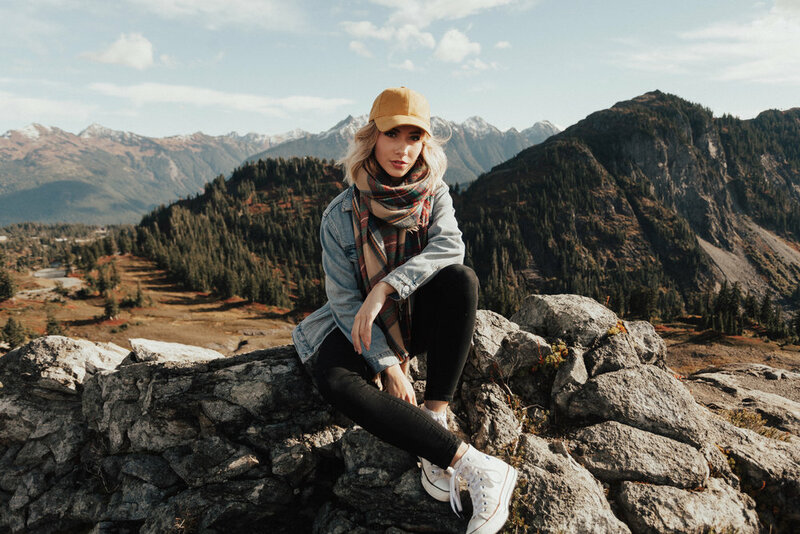 In another post not too long ago, I got to shoot with Sydney in the fall colors of the north cascades. It was pretty great to be able to shoot the same, yet somehow also different, colors of fall on the other side of the mountains. Thanks are in order to Kirsti for another great shoot added to the books. Congrats again on her recent engagement and shout out to Jeff for doing such a great job on those photos. Be sure to give both of them a follow on Instagram. @ginger_spice & @sjencer. Hey guys! As always, it's been ages since I last did a blog post. I'm gonna try and change that now though and in some new ways. In the past I have usually elected to save blogs for times when bigger events or stories have occurred. I have a lot of shoots planned with new models and new places this summer though. I would like to start doing shorter, and consistent, posts so that more images from each set get shared with everyone. So here goes. This past weekend I had the opportunity to take some photos with Natasha. As with most connections, we were introduced through social media and soon made plans to shoot together. I was hoping for some overcast and somewhat drizzly weather because I love the moody atmosphere and smooth light in those scenes. As we met up early Saturday morning however, the rain was descending on us in pretty extreme amounts with the forecast showing no sign of relief. After contemplating it for a few minutes we decided to be bold and go for it anyway so we headed north. We arrived and took our first shots here at Pass Lake where the rain had dissipated enough to permit us. Next we made our way down to Rosario Beach. The rain started to pick up again as we were here and, despite the claims of being weatherproof, I'm usually pretty hesitant about having my 5D Mark II exposed to too much. We managed to grab a decent amount of shots here regardless though. Natasha didn't have much experience modeling prior to this. She picked it up quickly though and did a great job taking direction and delivering what I was going for. It had been a few years since I last visited Deception Pass. One spot I was looking for, I couldn't remember how to get to. We stood at the overlook trying to decide whether or not to make the descent down. After driving all the way here and seeing the rain was subsiding we decided it was worth it. The beach was fairly crowded despite the weather conditions. I had to frame each shot with as little people cluttering the background as possible and cleaned up the rest in post. A few months ago I discovered a new way of editing my black and whites. I really have a soft spot for that now and I included a black and white version of most of the finals. After our hike back up from the beach, we drove back to the north side and checked out the views from beneath the bridge. Opposite from our time down at the beach, there were no people in sight down on this hillside which made shooting and just taking in the views much more enjoyable. For those of you who have been following my work throughout this year, you may have seen me posting with Jasmine a lot. We were introduced through a mutual friend and while I was living in the Portland/Vancouver area. We got to shoot together 4 different times and in 4 different styles. I have yet to work with another model who has such diversity and it was a pleasure to collaborate with Jasmine. Each shoot we did turned out with so many post worthy shots. For the sake of not having this blog be too fatiguing, I will just include a few from each session. Be on the look out for me to come on my Facebook and Instagram though. The first shoot we did was just a casual laid back fashion session. We met up at the Fort Vancouver National Historic Site and took some photos in front of the rustic architecture. During this shoot, I was looking to get more of a dramatic type feel. Right from the get go, Jasmine was really good at embodying the type of mood we were working towards. In between photos though, it was all laughs and smiles the entire time. A few months later, we got the opportunity to do something neither of us had really done before. A giant studio shoot. I have a studio setup myself, but this time a photographer friend of mine let me use his rented studio space along with all his lighting equipment so I was able to shoot with much more extensive lighting setups than in the past. I would say that I've developed a style of photography which consists of simplicity. I don't do too much editing to my images usually and try to create my images in camera through subject matter, composition, depth of field, etc. But it's good to constantly be expanding and learning new things as an artist and this is a concept that I'd be sitting on for a while. I wanted to do some sports/fitness themed composite images. So I shot Jasmine in the studio under dynamic lighting, then shot the background image separately and fused the two together later on. I think the final result turned out pretty well, though there is always room for improvement. I've been collecting more background images throughout my travels and I hope to do some more composites in the future with some other people. Check out a few more we did below. Shoot number 3. Boudoir. Once again this was a style neither of us had done before. I'm really happy with how this one turned out though. We shot at Jasmine's house and I'd say the whole setup was perfect. The color scheme of her room, decorations, furniture, lighting, etc. all created a really good atmosphere to work within. Shooting in the morning was a perfect time to utilize the big window in Jasmine's bedroom. With some overcast weather outside, the lighting was great. I think we did a good job keeping our shoot classy as well. From the outfits to the poses, we were able to create photos that were sensual but still somewhat tasteful and not overly trashy. It was a good one to check off my list and I'd love to experiment shooting in this style again in the future. Last but not least, shoot number 4. I had gone exploring in the Columbia River Gorge area and found some spots that I knew would be really cool to shoot at. We wanted to get epic morning light so we met up super early and headed east on the Oregon side of the river. After hitting some places on the Oregon side of the river, we crossed back over into Washington to shoot at Horsethief Butte. We didn't really have too much of a concept for this shoot. We just decided to go explore the landscapes and see what we came up with.